The long awaited album by Singapore's rock supergroup has finally been released. So is it worth the wait? 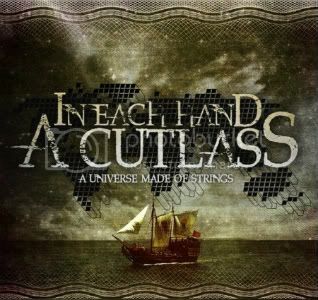 In Each Hand A Cutlass(IEHAC) consists of Daniel Sassoon(guitars), Roland Lim(guitars), Jordan Cheng(drums) and Amanda Ling(keys/samples). They've recently changed their bassist, so I'm not too sure on whether the new bassic is part of the studio recording or just the live band line up. Now on to the tracks in the album. Intro track, The Escape creates a build up of sounds to the hard-hitting and catchy, Inspector Cutlass, which features an addictive drum intro that builds up into a barrage of guitars and groovy bass slapping that just goes all out to hook you in and makes you wanting for more. Next up, Glaciers, one of IEHAC's most epic compositions in the whole album. Clocking in at a little more than 8 minutes, it begins with a dreamy intro that slowly pulls you in and bashes you aurally with its abrupt and loud bridge/breakdown. This song is slow at its build up but once it has reached its climax, you'd definitely place it on repeat. Next interlude, The March, brings us to the emotionally-charged Helmets and Fiery Endings. Other than the bridge in the track which features a little of that synth/keyboard from Amanda Ling, the guitar playing carries most of the song with its melodic riffs and fills. Following up next is the feel good track, Chocolate and The Lovelorn Girl. To be honest to label it "feel good" is a tad wrong, but as compared to the other compositions in the album, Chocolate and The Lovelorn Girl is more of a lush and soothing journey of textural sounds woven together than a sonic attack to our eardrums. Thus the "feely goodyness" of it. IEHAC's ambitious approach to songwriting really takes center stage with tracks Marauder, White Boxes and my personal favourite, Hammering The Bones, which features an intro that will certainly raise eyebrows. With its infectious guitar and synth combo that captures your attention, it later teeters off to a purposefully off-timed bridge that's later patched back together fluidly with a crunchy guitar riff and thumping drum line. Definitely a must-listen for progressive music lovers. In a full overview of the album, A Universe Made of Strings is progressively self-indulgent but still tries to maintain a certain catchiness and familiarity to each of the songs. It might turn off some conventional rock lovers but for those who would like to listen to creativity being tested, they will love A Universe Made of Strings. However, the few downfalls in the album is that it sometimes gets a little too self-indulgent and the guitar wizardry takes too big of a space on the album cause there times in the album that I felt like there should be something else in place but it usually gets cut short by the brilliant guitar work. I'm not trying to tell IEHAC how they should write their songs, but after listening to the album, I think some of us would agree that the song writing of the album mostly revolves around guitar parts rather than the accompanying instruments.